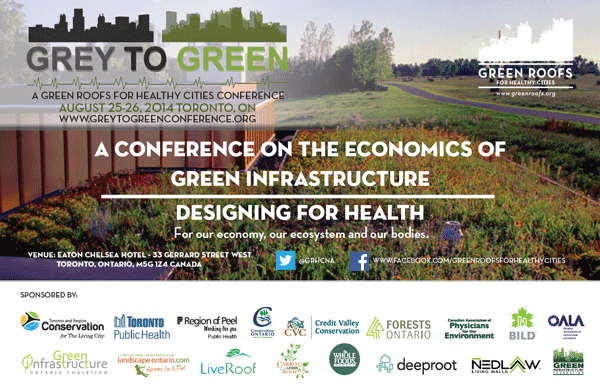 Robert Orland, President of Orland Conservation, will be delivering the presentation “Backyard Bounty: Transforming Urban Lawns into Local Food Havens” August 25, 2014, 10:15-11:45am, as part of the Grey to Green Conference in Toronto. A program of Orland Conservation, Backyard Bounty is Ontario’s premier urban farming social enterprise that converts urban lawn into organic vegetable gardens that feed the community. Urban agriculture connects city-dwellers to food production and encourages conversations surrounding sustainable production models in rural settings. Backyard Bounty is Ontario’s premier urban farming social enterprise that converts urban lawn into organic vegetable gardens that feed the community. The program has been serving nutritious, local, organic vegetables to the citizens of Guelph since 2009. Transitioning unproductive lawn into workable land encourages sustainable land use and food security in a landscape where farmland is being rapidly lost to development. Supported by sponsorship from corporations, Backyard Bounty partners with developers and non-profit food distributors such as the Guelph Food Bank to create a unique multi-partner collaborative agriculture model that helps the community get ‘up close and personal’ with the growth of their food. Learn about the successes and challenges to implementing such a unique program and ways to create similar positive change in your community. Robert founded Backyard Bounty in 2008 as the premiere urban farming and food security social enterprise in Guelph, Ontario. Backyard Bounty is a division of Orland Conservation, an environmental consulting group that offers a range of services in land conservation, sustainability planning and environmental communications to municipalities, conservation authorities and land trusts. Acquiring over 25 years of experience in land conservation, Robert began his career as an environmental planner with the Lake Simcoe Region Conservation Authority and worked in a variety of positions before specializing in land securement with the Nature Conservancy of Canada. A skilled strategist, public speaker and accomplished entrepreneur, Robert has delivered presentations and workshops as an expert on land securement across southern Ontario and abroad. Working in partnership with municipalities and government agencies for many years, Robert has facilitated and advised on the protection and creative stewardship of nearly 10,000 acres of environmentally significant natural heritage lands and parks in Ontario’s urban and rural communities. Robert also continues his work on a long-term plan to develop a unique ecovillage in partnership with conservation-minded individuals and families interested in becoming self-sustainable at a community scale. Robert is committed to making a sound contribution to the local food and urban sustainability movement in Canada.